The incidence of corporate taxation is a key issue in tax policy debates. According to surveys, most people think that capital owners bear the burden of corporate taxation. Since capital owners usually have high incomes, this suggests that the corporate tax is highly progressive. Business lobbyists challenge this view and argue that the tax reduces investment so that labour productivity and wages decline, which means that workers bear the tax burden. Most economists take a middle ground and think that the tax burden is shared between labour and capital (e.g. Felix and Hines 2009a). But even among researchers in the field, there is substantial disagreement about how much of the burden is shifted to workers. The main reason is that credible empirical evidence on the causal effect of corporate taxes on wages is scarce. Some studies compare wage growth in countries after corporate tax reforms to wage growth in other countries where no reforms take place. The trouble is that wage growth differs between countries for many reasons, and isolating the effect of the tax reform is challenging. In addition, countries do not change tax rates very often. Other studies focus on single countries and compare sectors or firms that face different tax burdens. Here the challenge is that the tax burden itself is usually influenced by the behaviour of firms. In a recent paper, we avoid these difficulties by exploiting the specific institutional setting of the German local business tax to identify the corporate tax incidence on wages (Fuest et al. 2017). There is substantial tax variation at the local level. Figure 1 visualises the substantial cross-sectional and time variation in local business tax rates. The left panel of the figure shows the cross-sectional variation for the year 2003, while the right panel illustrates the time variation from 1993 to 2012. Source: Fuest et al. (2017) based on Statistical Offices of the Laender, Maps: GeoBasis-DE / BKG 2015. Our analysis combines administrative panel data on the universe of German municipalities with administrative linked-employer-employee micro data from social security records. In these data, we observe firms in 3,522 municipalities, leaving us with 6,802 tax changes for identification. About 90% of the tax changes are local business tax increases. The blue line in Figure 2 shows that wages decrease significantly after tax increases. At the same time, our event study estimates are flat and insignificant in the periods prior to a tax reform. These flat pre-trends support our identifying assumption and the causal interpretation of our estimates. 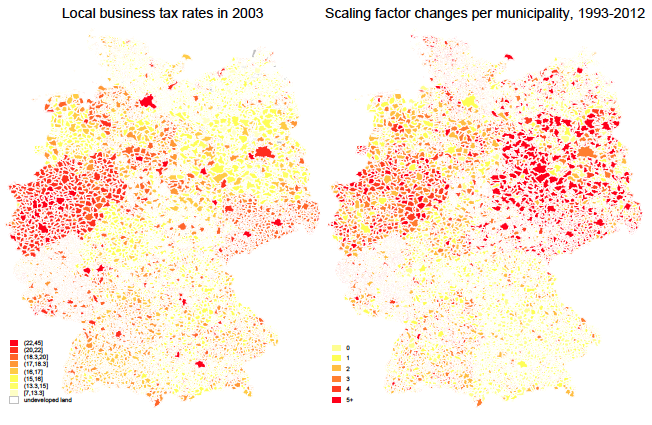 In addition, we also show that tax reforms are not driven by local business cycles. 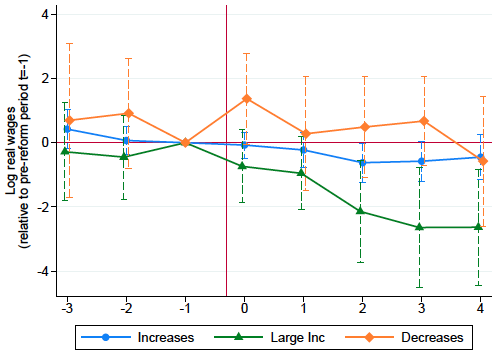 Intuitively, we find a larger wage response for large tax increases as indicated by the green line, but we do not find significant effects for the few tax decreases. Source: Fuest et al. (2017) based on LIAB and Statistical Offices of the Laender. Our estimates imply that, on average, 51% of the corporate tax burden is passed onto workers. This average effect is similar to other studies analysing the corporate tax incidence on wages (e.g. Arulampalam et al. 2012, Liu and Altshuler 2013, Suárez Serrato and Zidar 2016). Note that the overall tax burden includes the excess burden of the corporate tax. Empirical estimates suggest that the marginal excess burden of the corporate tax is roughly 30% of the revenue raised (Devereux et al. 2014). This implies that raising one euro of tax revenue via corporate taxes reduces wages by roughly 65 cents, or two thirds of the revenue raised. In addition to estimating an average effect, we find that different types of firms and employees are affected differently by wage changes. First, we find that labour market institutions matter for the incidence of corporate taxes on wages. In particular, collective bargaining agreements play a key role (as emphasised by Arulampalam et al. 2012, Felix and Hines 2009) – if wages are set via collective bargaining at the firm level, wage responses are larger than in cases where wages are set at the sector level or without collective bargaining. The higher the rents to be shared between firms and workers, the higher the pass-through on wages. For instance, wages are more sensitive to tax changes in more profitable firms. However, we find that wage effects are close to zero for very large firms, foreign-owned firms, and for firms that operate in multiple jurisdictions. This can be explained by the better profit-shifting capabilities of these firms. Second, different types of workers are affected differently, and this is particularly important for the distributional implications of corporate taxation. We show that higher taxes reduce wages most for the low-skilled, for women, and for young workers. These results qualify the widespread view that the corporate income tax is highly progressive. We assess the implications of these findings for tax progressivity in a back-of-the-envelope calculation. Our starting point is the study on the progressivity of the US tax system by Piketty and Saez (2007). They calculate effective average (personal plus corporate) income tax rates across the income distribution, and measure the progressivity of the tax system by comparing the average tax rate of the top 10% or top 1% to the average tax rate of the bottom 90%. Importantly, they assume that corporate taxes fall entirely on capital income. We take their data and estimates as a benchmark for the US, and use comparable data compiled by Bach et al. (2016) for Germany. We then compute two counterfactuals where 50% (or 100%) of corporate taxes fall on wages. The ratio between the total effective average tax rate of the top 1% and the bottom 90% decreases substantially from 2.9 to 2.2 if half of the corporate tax burden is borne by labour, or to 1.9 if the full corporate tax burden is shifted onto wages. We find similar relative changes of progressivity for the German tax system (decreasing from 6.1 to 4.6 and 3.7). Overall, our calculations imply that the progressivity of the overall tax system in both countries would decline by between 25 and 40% if we account for our incidence estimates. Source: Fuest et al. (2017) based on Piketty and Saez (2007) for the US-2004 and Bach et al. (2016) for Germany-2015. To sum up, our results confirm the view that labour bears a substantial share of the corporate tax burden. This reduces the overall progressivity of the tax system. Importantly, our results are obtained by exploiting variation at the local level. Corporate taxes levied at the subnational level exist in many countries, and our results are likely to be relevant in these countries as well. At the same time, it is important to discuss how our findings are related to settings with state-level or national corporate taxes. Two differences are important. On the one hand, labour is likely to be more mobile at the local level, which attenuates the incidence on wages. On the other hand, focusing on tax changes at the municipal level implies that changes of prices other than wages, in particular output prices and prices of intermediate goods, are probably much smaller than in the case of national corporate tax changes. This would imply that wage effects of local tax changes are larger. Arulampalam, W, M P Devereux, and G Maffini (2012), “The direct incidence of corporate income tax on wages”, European Economic Review 56(6): 1038–1054. Bach, S, M Beznoska and V Steiner (2016), “Who bears the tax burden in Germany? Tax structure slightly progressive”, DIW Economic Bulletin 51/52: 601–608. Devereux, M, L Liu and S Loretz (2014), “The elasticity of corporate taxable income: New evidence from UK tax records”, American Economic Journal: Economic Policy 6(2): 19-53. Felix, R A and J R Hines (2009), “Corporate taxes and union wages in the United States”, NBER, Working paper No 15263. Felix, R A, and J R Hines (2009a), “Corporate taxation and union wages”, VoxEU.org, 14 December. Fuest, C, A Peichl and S Siegloch (2017), “Do higher corporate taxes reduce wages? Micro evidence from Germany”, American Economic Review, forthcoming. Liu, L, and R Altshuler (2013), “Measuring the burden of the corporate income tax under imperfect competition”, National Tax Journal 66(1): 215–237. Piketty, T and E Saez (2007), “How progressive is the US Federal Tax System? A historical and international perspective”, Journal of Economic Perspectives 21(1): 3–24. Suarez Serrato, J C, and O Zidar (2016), “Who benefits from state corporate tax cuts? A local labor markets approach with heterogeneous firms”, Amercian Economic Review 106(9): 2582–2624.